Lots of great tips! We can never be too safe with tiny, curious hands. Even without little PEOPLE in the house, it’s so important to ‘babyproof’ for your pets, too! So many hazards, we have to be vigilant! Great reminders! I have all my detergent and cleaning products on high shelves. I actually need a stepstool to reach certain ones. Thanks for being part of this safety campaign. There will always be new parents who need to be informed about safety issues. The detergent pods must look like an awesome toy to a baby. I don’t use pods often, but when I do buy them (coupon deal only) I keep them up on a high shelf. Great campaign!! The tip to put yourself at your baby’s level is smart! I don’t have young children to worry about, but with five Treeing Walker Coonhounds and three cats (all rescues) I do have to be careful with things like this around them. I don’t think enough pet owners know about the dangers of those pets getting ahold of “pods” used for laundry and dishwashing. Never tried the pods. Very good information to have!!! I always keep my products out of reach. And the ones that are in the cabinets, they have the child locks on the outside. And i buy the good ones. The ones where you have to perform 2 actions to open. I keep all of my cleaning products up high on a shelf in a closet, but these are all excellent reminders. Kids move so fast and can sneak away when your back is turned. I’ve been trying to use natural cleaning products. I won’t use the pods because I’m worried my daughter will mouth them. This is a great idea. My brother almost died twice as a kid after drinking perfume. He got his stomach pumped on two different occasions! I’ve heard about this recently. Keep the chemicals (including laundry detergent) out of the reach of kiddos! A few days ago, I actually saw an array of laundry products displayed for a giveaway, and my first thought was that they were candy! When I was a kid, my parents had “Mr. Yuk” stickers that they put on cleaning supplies and other things that we shouldn’t eat! I follow these tips already, but thank you for the reminder! This is all very good advice! We especially need to take care with the new laundry pacs. I think the new pods are too expensive and not safe for kids. Great tips, I really want to try the pods or the flings! Always interesting to learn new tips ! What a wonderful tips shared on here. Some of these I know about there was some I didn’t know about I will remember these tips. Thank you for sharing these tips on here. This is a good reminder because I know, as a parent, I have gotten lax on this things. I don’t use the Tide Pods, but this is something that I wouldn’t have even thought about. I’m glad that I took the time to read the article. I have read a lot on this lately. Thank you. Thanks for such an important list of things to do when it comes to the little ones. Their curiosity is a normal trait in all kids and as such we need to be vigilant in being careful. Thank you for your post. Great safety tips, thanks for sharing! This is really important for parents to follow. Our laundry is in the basement, which we have a locked door to. Very interesting article. Kids are curious so keep stuff put away. Good information! One of the reasons ALL cleaning products should be kept locked up or out of reach of children. This was a really great read! This is some wonderful information and I’m going to be passing it along to my family and friends. Thanks for sharing! This is great info! We don’t use pods here just for safe measure here! 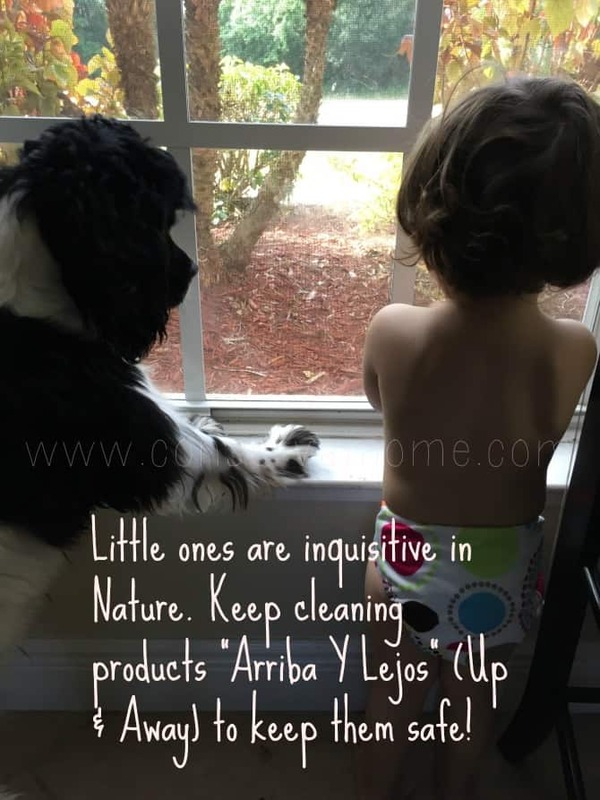 Good tips…my little one is soooooo curious about EVERYTHING!!! I try to use natural products and we definitely keep them out of reach! Good tips. My kids are past the phase of getting into this kind of thing, but my dog is always a concern. Thank you for the advice on keeping him safe. What a great idea for a safe home. We all need reminders. thanks! I love Tide, the only laundry soap hubby will buy! But, he will NOT allow pods in the house. He is afraid the kids or the cats will get into them. I do agree! I love them, think the just pop in the wash are great, but they must be away from kids! Great ideas! We clean with Enjo and love tide powder for cloth diapers. We don’t use the pods, but all of our cleaning supplies have been locked away from baby. It’s crazy how fast they start getting into everything! This pods have been around for some time. The pakaging specifically says keep out of reach of children. It is always tragic when a child gets hurt or worse but it is our responsibility as parents to keep our little ones safe. Thank you for this! We used pods probably about 2yrs ago and stopped. Even though the liquid can be a pain to lift and pour I just prefer the liquid over the pods. What a great reminder!! My son is totally intrigued with out dish pods so I will always remember “Up Up and away! !” Its a shame we keep all these chemicals under the sink…. not the best place!! I converted my hallway closet to store all household chemicals. Then I replaced the doorknob with a doorknob that requires a key to open the closet. Now I don’t have to worry about the little ones getting into the cleaning products. Keep my laundry detergent up high, but have caught my LO with a dishwasher tablet before.. it was a good reminder to check all my cabinets even the ones with the child locks, they figure those out really quick. This is so true! One of our greatest fears is our children accidentally swallowing something that could kill them. Thank you for these wonderful tips that all of us need to adhere to. Good reminders for anyone who deals with children. I keep anything that can harm my children like cleaning products & medicine locked up where kids are not able to get into it. This is very informative, thanks! Thanks for all the great tips! Very informative. Curious toddlers need reminders why we’re keeping them out of reach, especially when they figure out how to open childproof locks. I think to many people assume their products are out of reach but you never know. Better to be safe and be extra cautious. This is so important! Please keep them out of reach! these are great tips. treat this just as you would your medicine. Thank you for posting this! Such important information! Remember to secure your tvs and bookshelves and watch for pointed things like dog kennel doors, too! Not just cleaning products but medicine, beauty products, etc should all be kept out of reach! Yes, to this. These tips were not only great but super important. As parents we need to very diligent in how we store things that would pose a danger due to a child’s curiosity. I didn’t know this was Poison Prevention Week. Thanks for the reminders. I can see my poison control number hanging on the fridge right now. Thanks for the reminder. My babies are grown, but I need to get back into the habit for the grandbabies. A reminder is always good when it comes to your babys safty thanks! Thanks for passing along the tips. Thank you for the tip. As a grand mother I have to make sure my house is safe for my grand children’s when they come to visit and spend time with us. Very good information and all true! Thanks! My son will be crawling soon….good safety tips! So many things should be ” up and away” from little ones!! great idea! 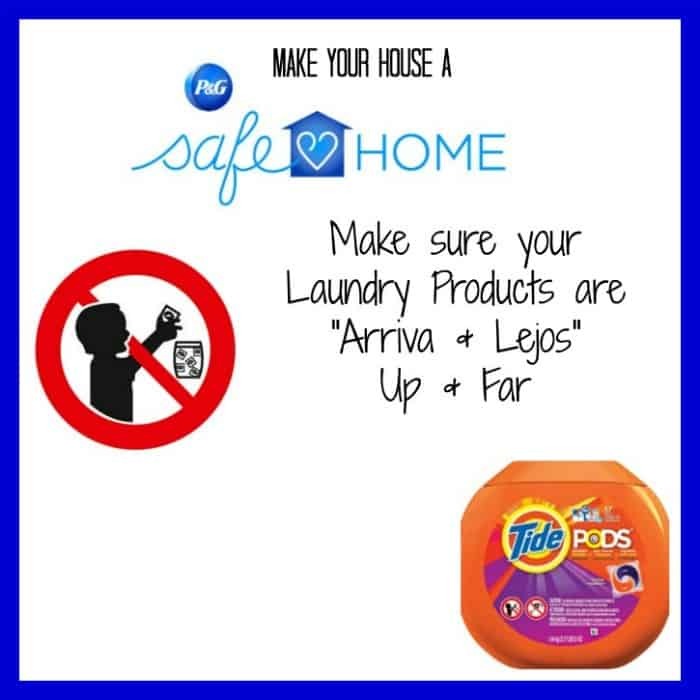 These are great reminders for ensuring the safety of our little ones, even from things like laundry pods, that may not normally have crossed our minds as being toxic and dangerous to curious children. I’m working on childproofing our home now! Our pediatrician recommended all such products be up and irretrievable, not just behind a child lock in a floor cabinet. 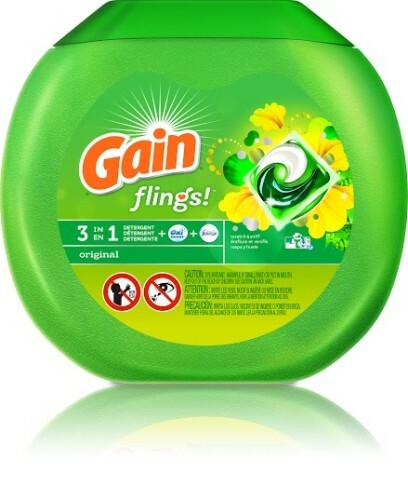 I have seen news reports about those fun colorful laundry pods. my sister’s laundry products are in her basement which the little one can’t go down to so that is good! but great info! I ALWAYS put mine up! Ours are always far out of reach! We keep them up in the top of our linen closet. I never would have guessed these pods would be so inviting to kids. Thanks for all tips. As a Mom of two boys ~ these were great tips! Great tip for parents. It’s important to keep the little ones safe! This is so important, thanks for sharing your safety tips! It’s amazing the things kids can reach and get into, they’re very creative! All are great tips, you can never be too careful! Nice reminder for grandma and grandpa to baby-proof their home! I like keeping my detergents on a shelf above the washer and dryer partly for this reason. I have tall girls so I’m constantly worried about hot pans and knives ans my youngest loooves to climb (she’s only 1) So, I think the most important to remember is detterents are good to have but there is no substitute for adult supervision! No matter how precautious I think I am I still am frightened by the thought she still might get into something. Thanks for sharing this info…nice for a first time mommy. Goos things to keep in mind. Good article. A safe environment for your little curious toddler is an essential. Out first is about to start crawling so we should do all of our babyproofing very soon! Good article. I am way more careful now on how or where I put cleaning products , specially the tide pods since they look like so interesting! lol my boy would definitely think they are some kind of toy.. Thank you for bringing some light to these issues! Great information! This is great info for all parents! Good information. I was so excited when we moved into our home 2 years ago to find that the laundry room at upper cabinets so I could keep all cleaning supplies out of reach of our kids. I think these tips are very important when you have young curious children as I do!